This itinerary features many of the “hidden gems” that can be found along the Inside Passage. 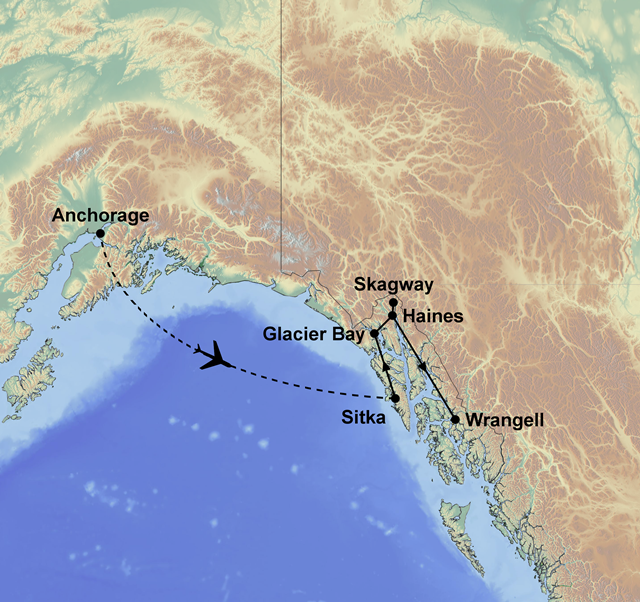 Towns such as Sitka, Haines and Wrangell are rarely visited by the large cruise ships. Some of Alaska’s most spectacular scenery and wildlife can be found around these towns. This itinerary can be combined with a tour of Western Canada, Interior Alaska and the Yukon. Accommodation in clean and comfortable hotels with private facilities, meals as indicated (B=breakfast, L=lunch, D=dinner), Light plane flights: Sitka/Gustavus and Gustavus/Haines, Return transfer: Gustavus/Glacier Bay Lodge, Glacier Bay Cruise, AMHS fare: Haines/Wrangell (including cabin), Fast ferry return trip: Skagway/Haines, White Pass Summit Excursion, AnAn Bear Observatory, Le Conte Glacier. Full day at leisure. Situated on the west side of Baranof Island, Sitka is one of the most beautiful towns of the Inside Passage. The town has retained much of its original architecture from the period when Russia controlled Alaska. Major highlights include the renowned Raptor Rehabilitation Center, whale watching and Saint Michael’s Cathedral. At leisure to explore the town and the surrounding countryside. Originally a Russian and Native American trading post, this little town provides beautiful views of the Chilkat Mountains and Lynn Canal. With only a few small cruise ships docking each summer, Haines has retained its local identity as a quiet South East Alaskan town. In the morning travel by water taxi to Skagway. There is time to explore this well preserved frontier town before taking a ride on the White Pass & Yukon Railroad. Built during the days of the Klondike Goldrush, this is one of the most interesting rail trips in North America. You can view glaciers, waterfalls and historic sites. Return to Haines by water taxi in the afternoon. Travel by jet-boat to the Le Conte Glacier, the southern most active glacier in the northern hemisphere. Depart on either the AMHS or by Alaska Airlines (cost not included).